Singapore's exports ended 2018 on a surprisingly weak note, with non-oil domestic exports falling for the second straight month in December and dashing economists' expectations of a 2 per cent rebound. 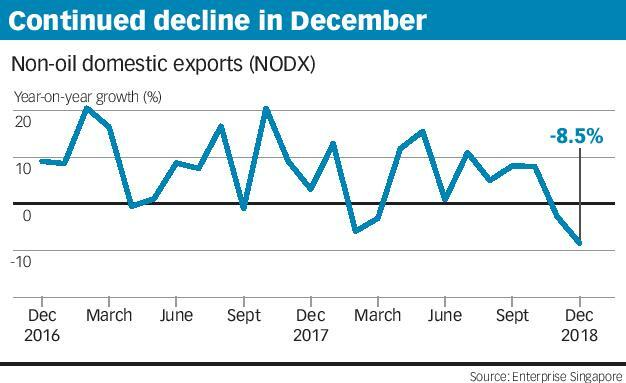 SINGAPORE'S exports ended 2018 on a surprisingly weak note, with non-oil domestic exports (NODX) falling for the second straight month in December and dashing economists' expectations of a 2 per cent rebound. Economists see this as part of a bigger picture of regional trade weakness that could extend into this year. OCBC economist Selena Ling described December's performance as being "in line with the recent trade data disappointments out from China, South Korea, Taiwan, Philippines and even Indonesia". Figures released by Enterprise Singapore on Thursday had NODX as being down 8.5 per cent year on year in December, down from a high base, after a 2.8 per cent decline in November. This made for the first consecutive fall since February and March last year. The contraction came on the back of declines in both electronics and non-electronics exports. Electronic NODX was down 11.2 per cent year on year in December, after 4.3 per cent growth the previous month. Ms Ling said this suggested that November's growth was "just an anomaly" as it came after 12 straight months of decline. Contributing most to the fall were contractions in exports of personal computers (-20.5 per cent), disk media products (-28.5 per cent) and diodes and transistors (-34.4 per cent). Domestic exports of non-electronic products declined 7.4 per cent, continuing the previous month's 5.4 per cent fall. This was due most to falls in exports of specialised machinery (-32.5 per cent), pharmaceuticals (-26.8 per cent) and primary chemicals (-28 per cent). On a month-on-month seasonally adjusted basis, NODX was down 5.7 per cent in December, deepening from November's 4.3 per cent decline, due also to falls in both electronic and non-electronic NODX. ING chief economist and head of research for Asia-Pacific Robert Carnell said it was hard to pin the decline down to any single geopolitical event such as the trade war between the United States and China. In December, those two markets were the only two of Singapore's top 10 markets that did not see NODX fall year on year. The largest contributors to the overall NODX decrease were the European Union 28 (-28.7 per cent), South Korea (-39.1 per cent) and Malaysia (-15.5 per cent). But SIM Global Education senior lecturer Tan Khay Boon cautioned: "The respite in exports to US and China may be short-lived if there is no breakthrough in the trade negotiations between both economies. "With Brexit becoming messy, trade with the EU economies may become more pessimistic." Maybank Kim Eng economists Chua Hak Bin and Lee Ju Ye expect the growth in NODX to China - which comes after declines for most of 2018 - to be only "a brief respite", as China's slowdown will likely reduce import demand this year. "Regional trade has entered into a downturn, and frontloading of exports seems to have ended for most countries in October," they added. The outlook remains bleak. Ms Ling said, given the high year-on-year base for the first quarter, NODX growth "is likely to continue to disappoint, barring any rapid turnaround in US-China trade talks and a firm resolution to the contentious issues between the two sides". She expects NODX year-on-year growth to flatline this year, at the low end of the official forecast of zero to 2 per cent growth. UOB economist Barnabas Gan said that while December's slowdown may be attributed to a relatively high base effect, it does highlight negative effects from the trade tensions amid a fading technology boom. His forecast for this year's NODX growth is 1 per cent.